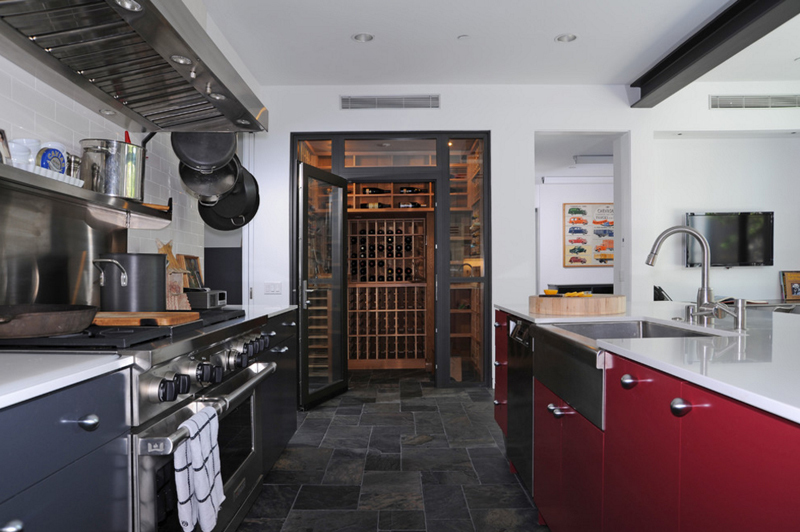 Want to add a wine cellar in your kitchen? Here are ideas for you. Researching on this topic about wine cellars, I discovered a lot of things – like the main purpose of a wine cellar, the different names of spaces where wine is stored differ from the number of wines kept in them and also if it’s built underground, above ground, in cabinets or in closets. Pretty interesting stuff actually, I suggest you do the same and read all about them! 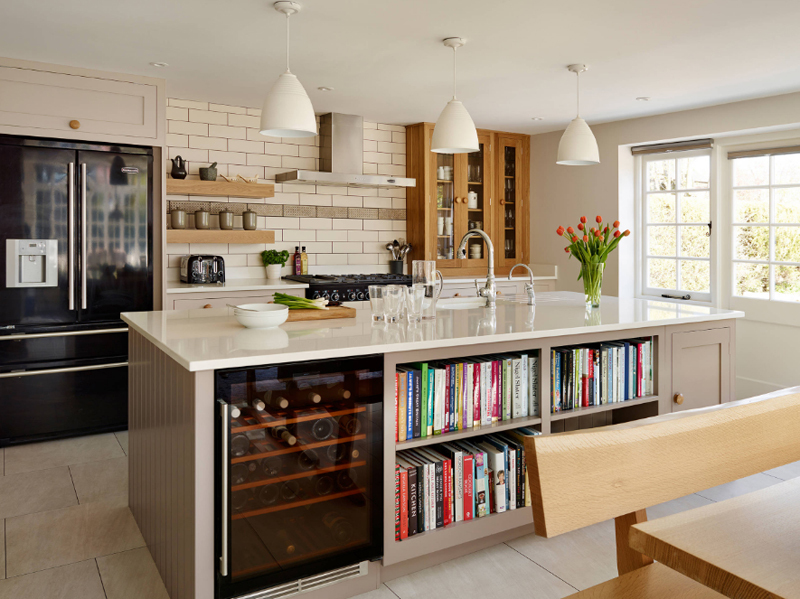 Now, for today, we would be showcasing a couple of kitchen photos that have wine closets, cellars and even fridge-like cabinets where wine could be stored in the kitchen. If you are in fact a wine collector and maybe drink much of this, I think you’d prefer keeping them well for future consumption, right? 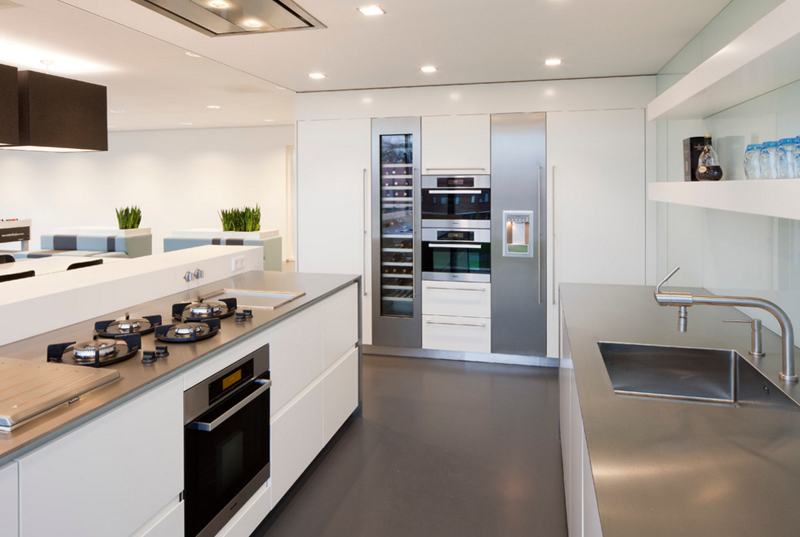 Now, let us check out the awesome kitchen spaces below and see which type of storage works for you! I remember that we have a list here in Home Design Lover that involve wine cellar that are positioned under the stairs. 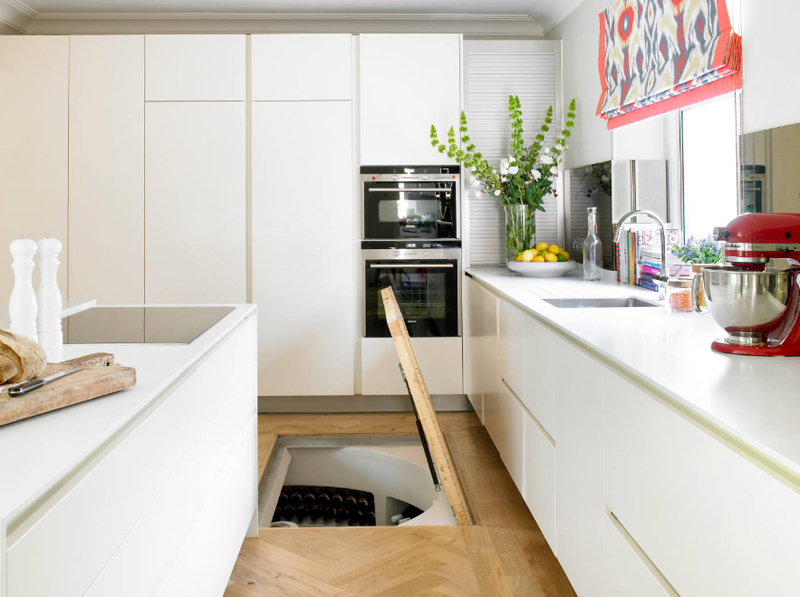 More than anything, I am amazed at people – designers and home owners alike who consider adding wine cellars under the stairs while others did not even think about it. 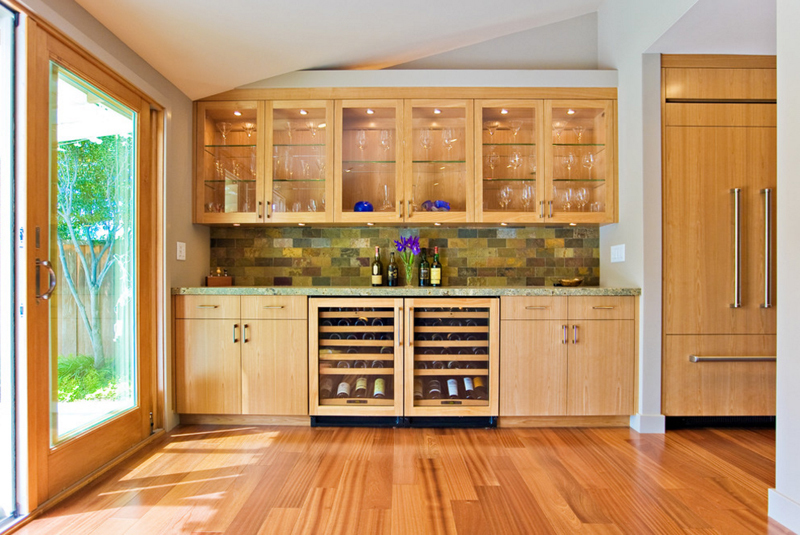 Aside from making them cupboards, wine cellars are great alternatives, especially of you love wine and collect them. 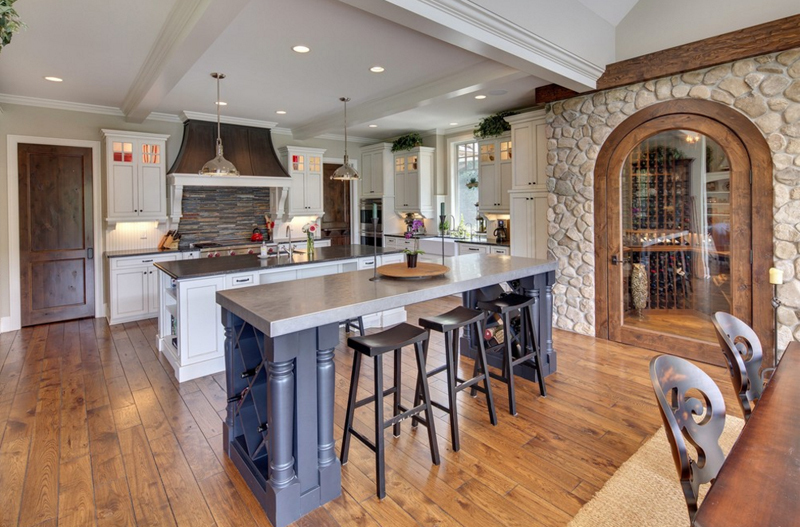 Adding a wine cellar in the kitchen is a great location since most of our food and beverage are there and accessing wine would be so much easier when it is just in the kitchen. From the looks of this wine closet, they really chose to use glass so that you can easily see which one to pick when you are planning to drink some wine or bubbly. 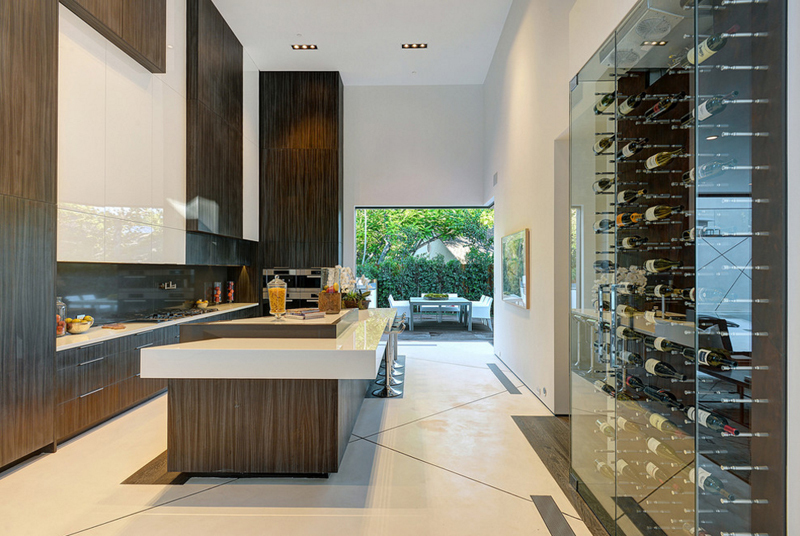 Aside from the stunning wine cabinet that we see at the end of the kitchen bar, check out how sleek and wonderful the color palette used here. White with hints of grey actually really is great especially for kitchens because they help us see how a clean a kitchen should actually be. I am amazed how they used low chairs for the kitchen bar, but then again, they lowered the counters to match the height of the chairs. Noticed that the design of the back rest of the chairs is a bit Asian and it looks real unique and pretty. The display area of the wine sure looks awesome too! This home has an open concept and we see how large the space actually is. The color of the wood is real pretty and they made sure that the color of the furniture in the kitchen and in the living room complement the wood. The wine closet is seen on the side and I think it sure is classy and fancy. 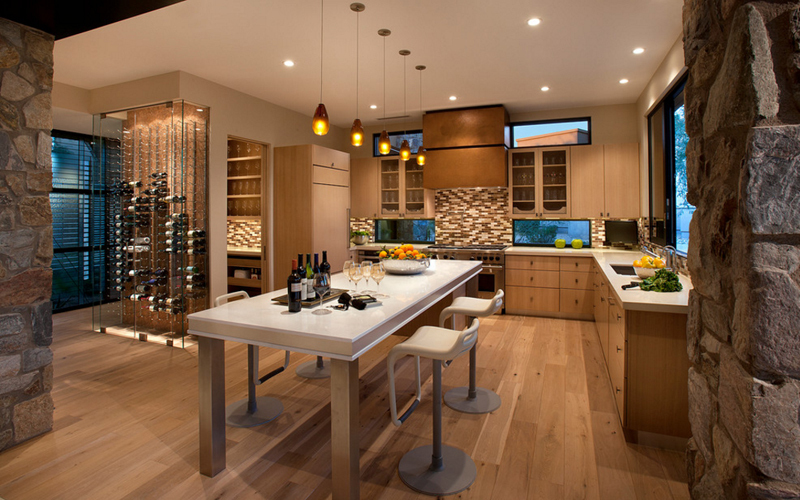 We see a small part of the wine cellar in this kitchen but sure see it clearly. This kitchen is simple and quite raw. 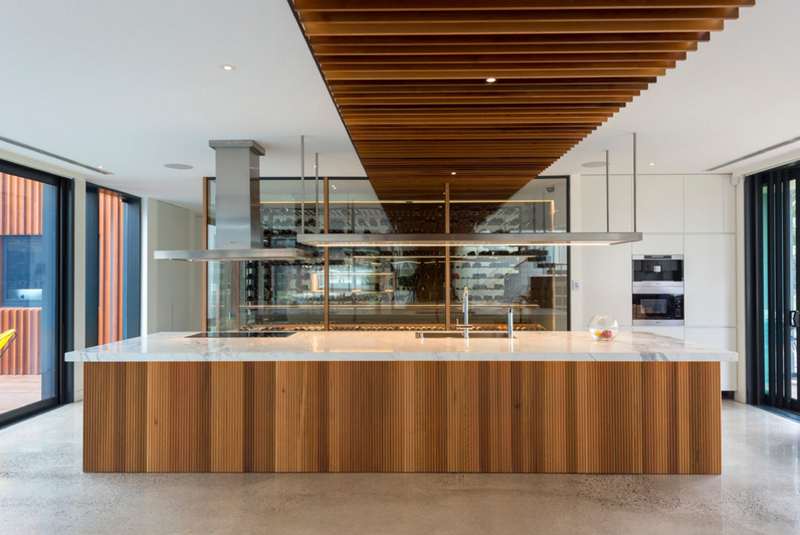 I think that you should check out the wooden cabinet that holds the counters and one wall of the kitchen, it’s contemporary and quite nice to look at. 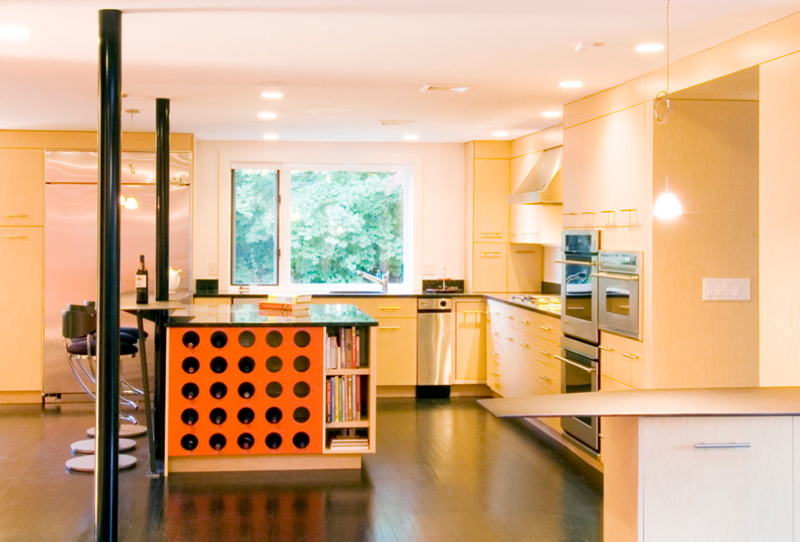 The wine fridge of this kitchen is something similar to a few of the ones in this list. This is one small, easy to install and quite common nowadays for homes that collect wine but not necessarily a lot of wine at the same time. It’s basically a small fridge that holds all the wine to maintain the temperature that’s ideal for these drinks. The color of the wood in this kitchen space is quite charming, it’s not too light, it’s not too dark – it’s like in the happy middle of it all and it’s quite nice to look at. From the looks of the kitchen bar that is also somehow a dining table – they have a couple of wine bottles on it that shows how much the people living in this house loves to drink (or at least, for show). 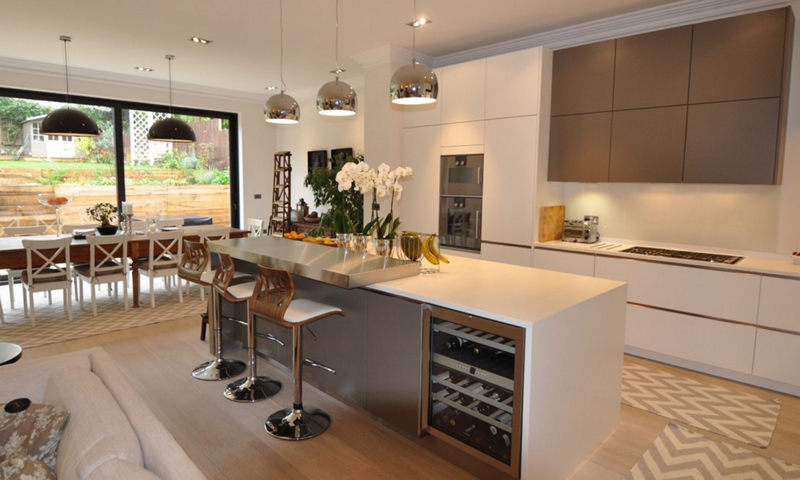 This white kitchen is indeed pretty, classy and fancy! 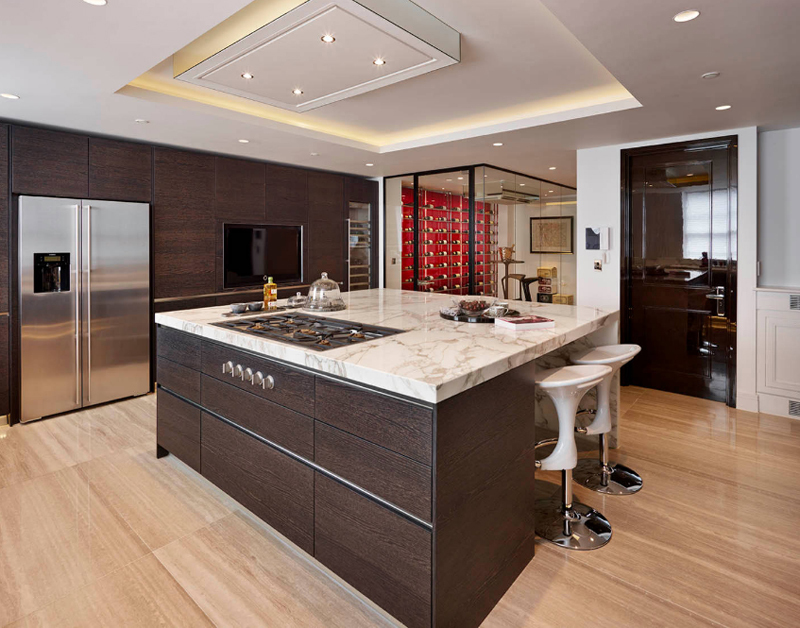 The choice of materials, appliances and fixtures is something people who value great material appreciate. Aside from having an awesome set of things in here, this kitchen sure has great traffic flow and that’s something really important too. Are you wondering what you can do with one of your many cabinets in the kitchen? 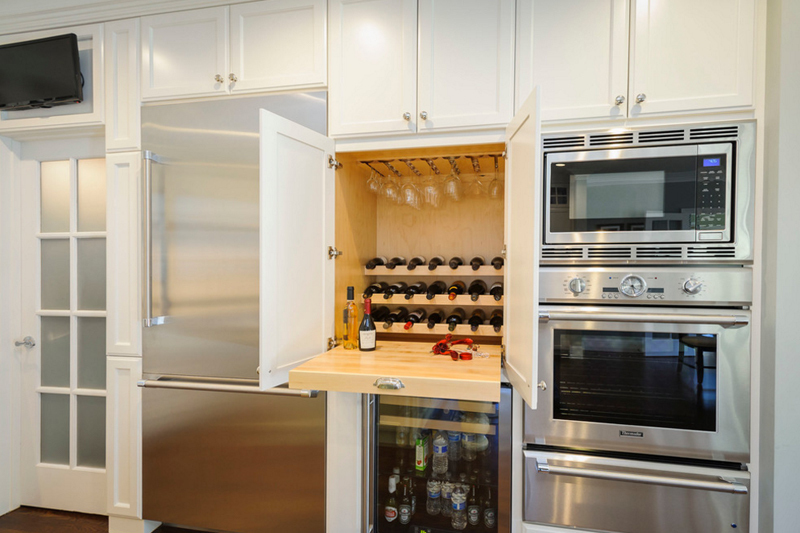 Well, like this kitchen, they used it to specifically store wine and wine glasses, just below this wine cabinet is a small fridge that holds the beers and some sparkling water that you don’t need occupying the larger fridge you have. I felt a little happy when I saw that this kitchen has a small door (not literally) that opens to an entire room with wines in it! I am personally not a big drinker but this is one thing that I really appreciate because this means that you do not have to go to the grocery to buy wine when you want to drink. The beautiful color palette of this kitchen is something I am sure the home owner is proud of. If you think about it, this space is basically made from wood, concrete and stone and this is how it look – like wow! Such a beautiful place to be in everyday; plus you have those wine just around the corner, I think life is just gets better! The multi-purpose kitchen island brags a wine fridge, book shelves and a small cabinet facing the dining room set and behind is a cute counter set up with the two-door refrigerator and the gas range. 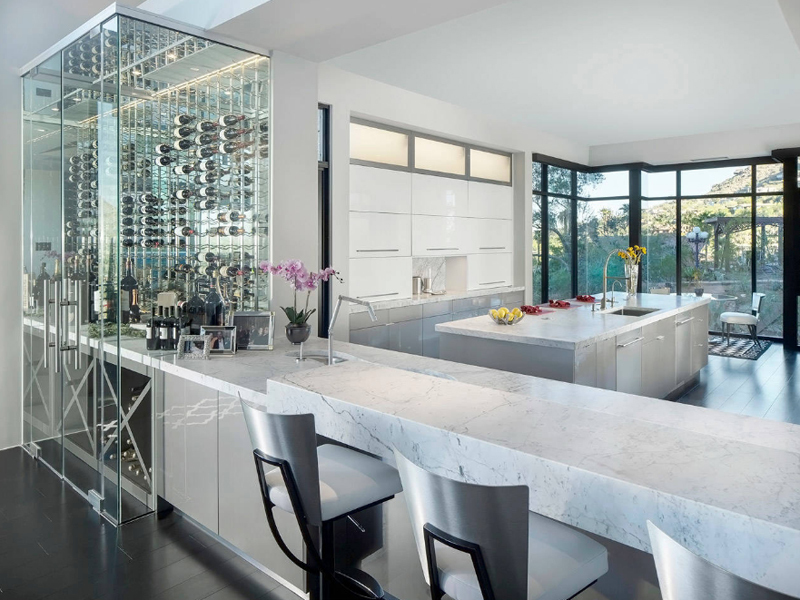 We only see the portion of the kitchen that has the wine fridge and the wine glasses display area. I love the color of wood used for the cabinets, drawers, the flooring and the door jamb! 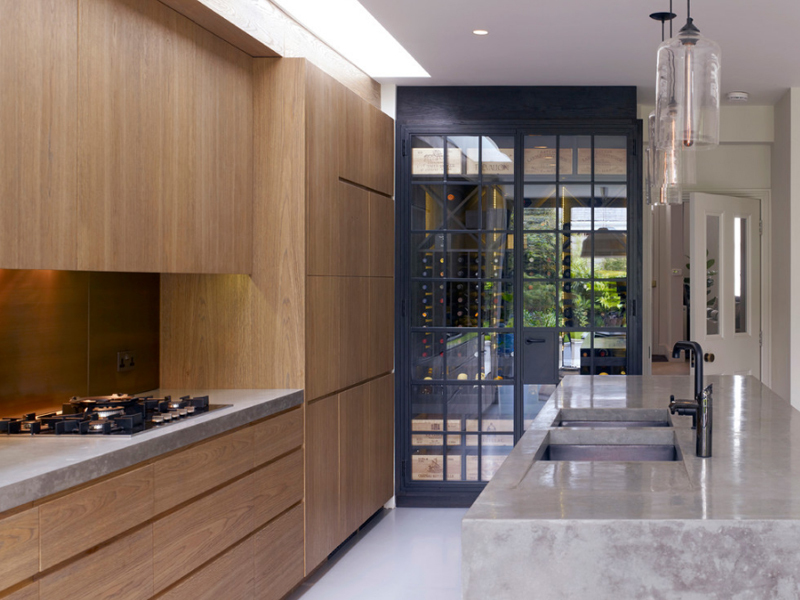 Fabulous space and awesome lighting and ventilation – this kitchen is superb! 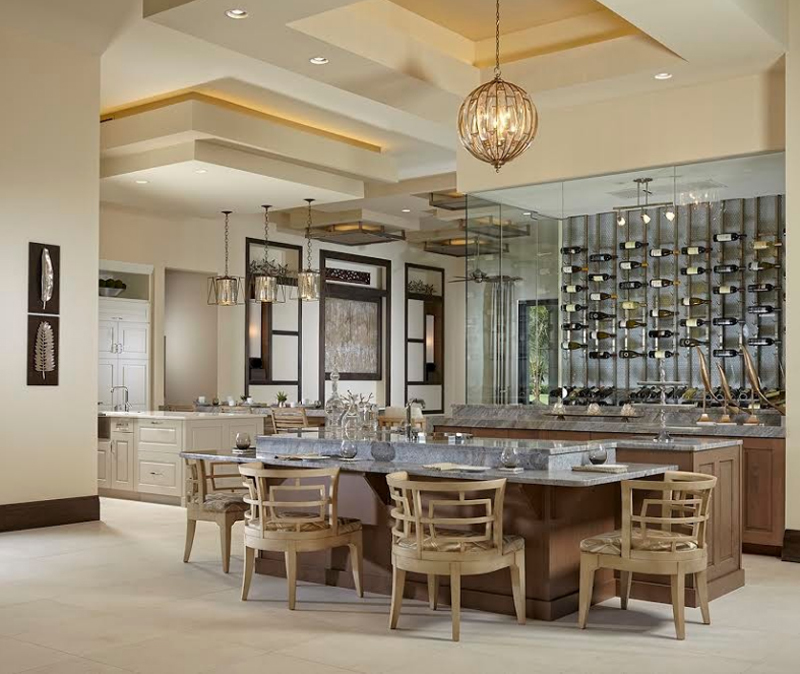 I included this kitchen space to this list because of how unique the wine cellar is; imagine a basement or an underground wine cellar like this one for your house, pretty awesome, right? This is one of the kitchen islands that I like because it is multi-purpose. Like the one before this and the few others in this list, some of the kitchen islands here are multi-purpose. This is something that home owners and designers like because there are times that we want a lot of things and we have a smaller house, so we go for things that are more useful and allows us to save more space! 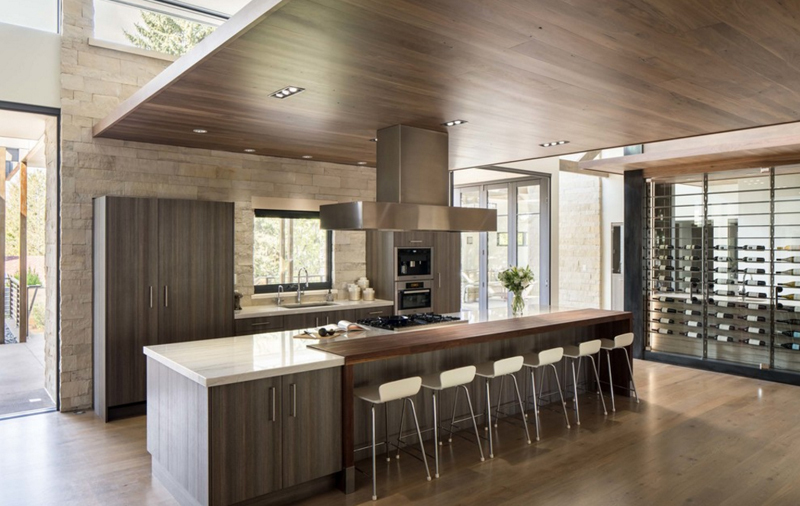 Look at the accent on the ceiling and the material on the kitchen island, pretty awesome, right? Since this is a white space, adding accents or material, even furniture would surely bring out the beauty of the entire space – especially when done right. The wine cellar in this kitchen may be a bit far off in this photo, but I am sure that you actually see how large the space is and how much wine there is. If I am not mistaken, there is even a table and chair in there for the times when the home owner would actually want to drink without leaving the space. I love how the wine cellar in this kitchen actually has an entrance made from stone – imagine the old wine cellars or underground where large amount of wine or barrels are kept in Barcelona or in any wine country? Looks and seems like they followed that style to have an awesome aura for the wine cellar. Finally, the slim wine case in this kitchen is quite amusing. 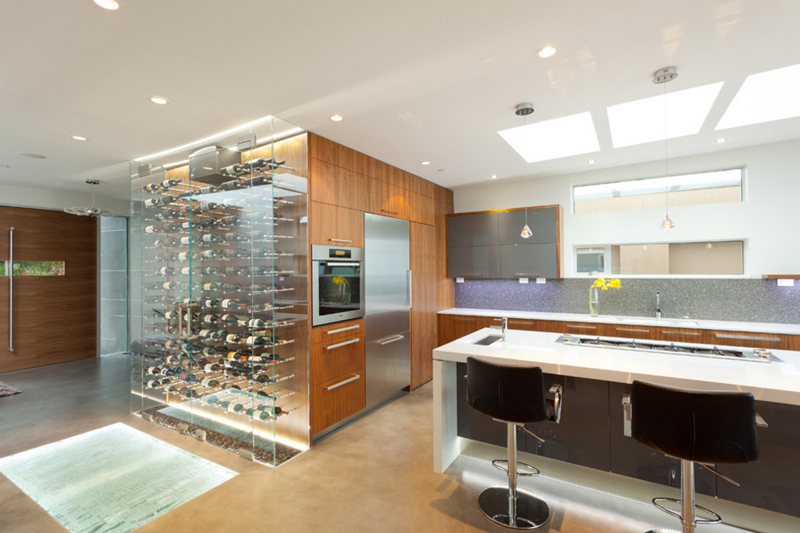 It is in fact like a slim see-thru or glass cabinet where the wine bottles are kept – plain and simple. They surely had this specially made for this home to fit the space where the oven and fridge are located. If you found this list riveting or interesting, you should do a rerun on the list about wine cellars that one of my colleagues created about it – the 15 Sleek Ideas for Modern Wine Cellars and check out which ones do you have in your house if you have one and which one could you add to your house for future additions you are planning to have.